There are moments in watching a sunset that you think that no-one could capture the majesty and grandeur of the sky yet this is what Steven Outram achieves time and time again. ''Thundercloud'' is an example of this. There is a stillness and quiet serenity about Steven Outram''s paintings. We are invited to stop and contemplate the beauty of the world around us. Outram''s contemporary oil paintings are uncomplicated and have a purity and honesty which makes them fresh and interesting. 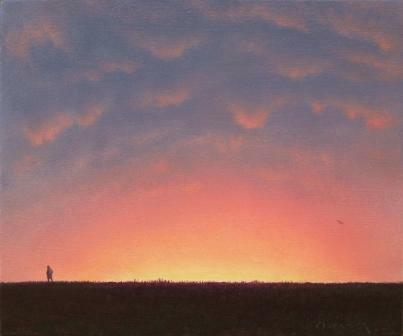 In ''Thundercloud'', Steven Outram paints the small silhouette of a man against the vast dramatic backdrop of a glowing red sunset. The small figure of the man gives us some sense of scale.